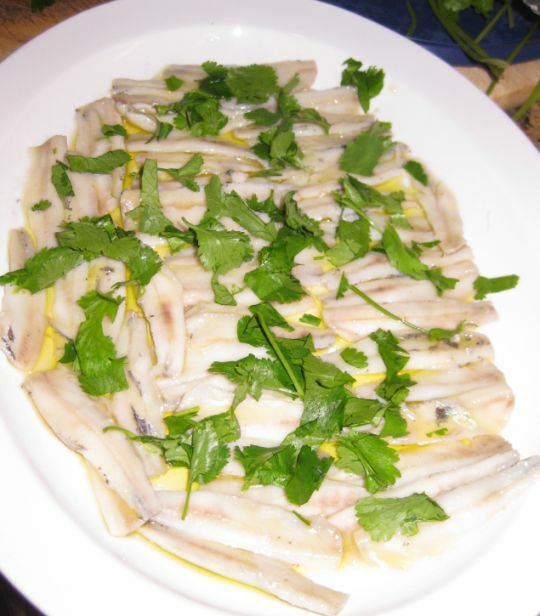 Boquerones are small, fresh anchovies marinated in white vinegar. Accompanied by crisp, fresh bread, a glass of red wine and they are a delight to eat. 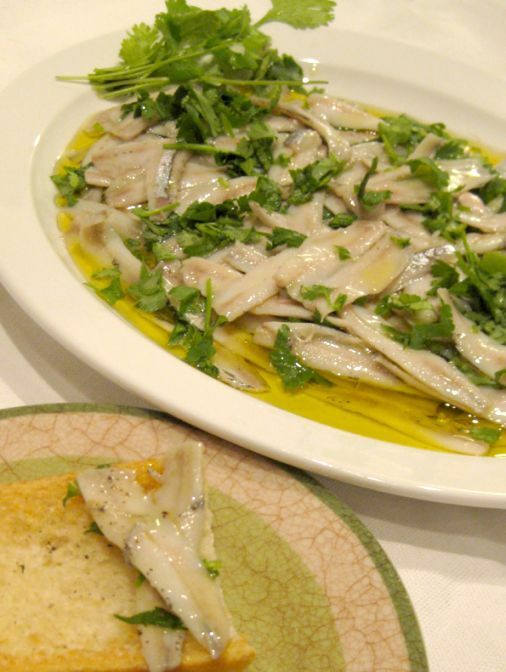 Anchovy is an oily fish packed full of proteins and minerals, protecting against heart disease, and "good" for cholesterol. 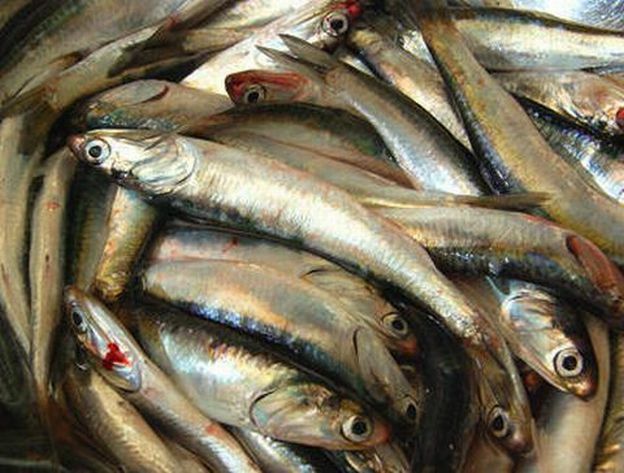 Methods for preparing boquerones tend to vary slightly from family to family. However, the basic principles are always the same. You first have to clean and fillet the fish, which is simple enough, but rather tedious until you get the hang of it. Next, you soak the fillets, either in white wine vinegar or a mixture of half vinegar and half water. The vinegar will clean and bleach the fish. Some people sprinkle the fish with salt; others feel that the fish is salty enough already. The fish has to be left for a good few hours to overnight soaking in the vinegar. Again, this tends to vary, with some Spaniards leaving them overnight in the fridge and others just waiting a couple of hours. Also, some families change the vinegar/water-and-vinegar mixture once during this process, while others do not bother with it. 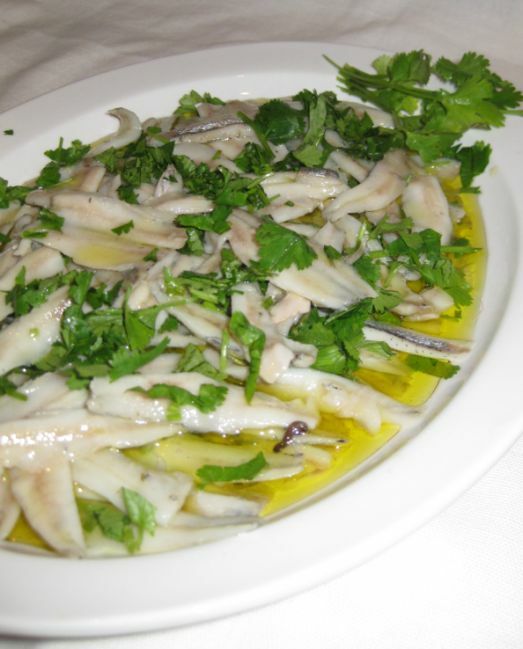 Once you have thrown away the vinegar, the bleached fillets are covered with a good quality virgin olive oil, which will preserve them. You can add as much, or as little, sliced garlic as you wish, plus freshly chopped parsley. 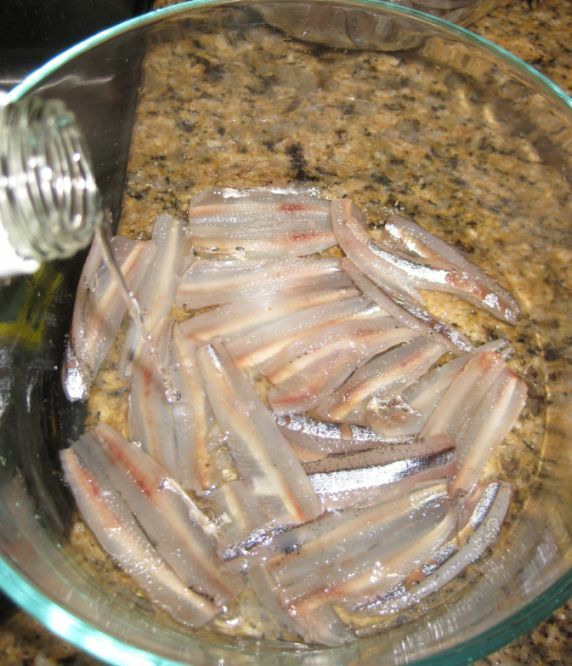 I soaked the anchovies in good olive oil given the boquerones an excellent flavor. We had this dish at Esperpento, a Tapas restaurant in San Francisco. Each plate had maybe 10 anchovies so we had to order at least4 to 5 plates so everyone could at least a couple bites. 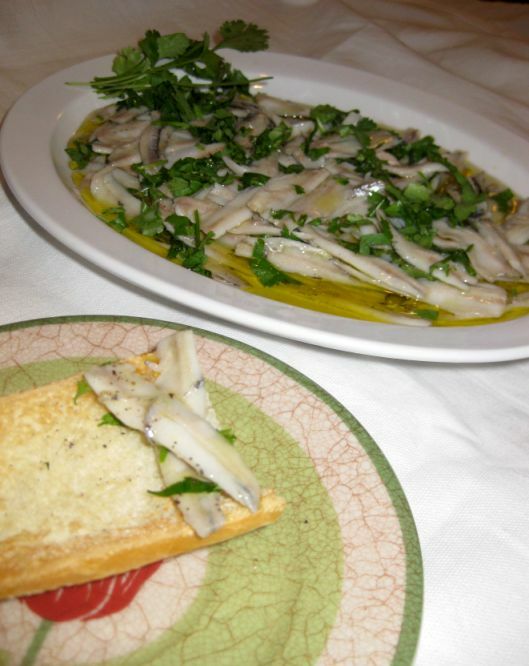 Serving the Boquerones with toasted bread! They are so good and so healthy! 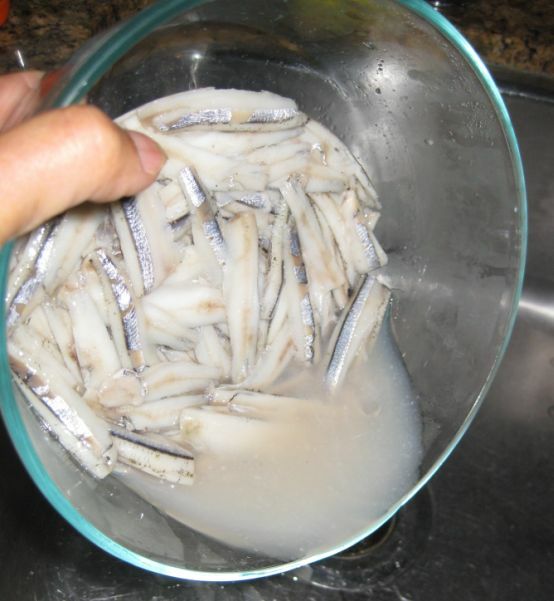 Clean your anchovies by rinsing them under cold water. Cut off the head and tail. Slit along underside and discard innards. Open out the fish and remove the central bone. 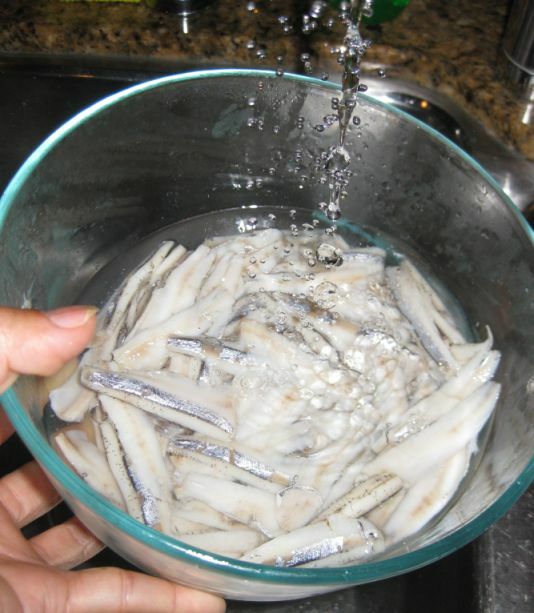 Rinse the anchovies well with water. 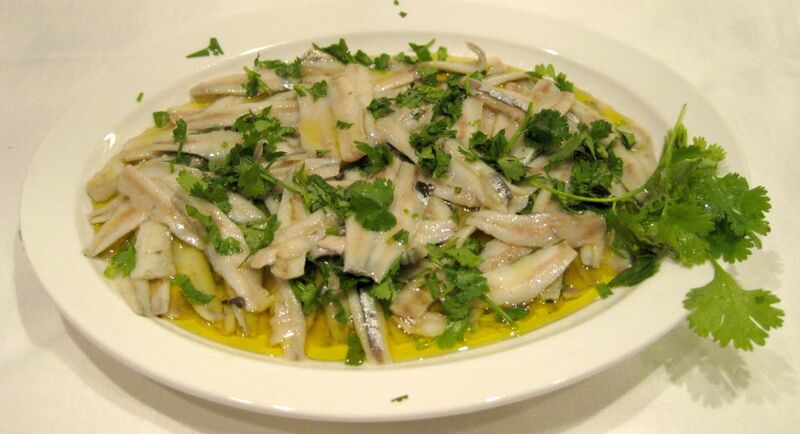 Place a layer of anchovy fillets in a shallot dish. Sprinkle with salt. 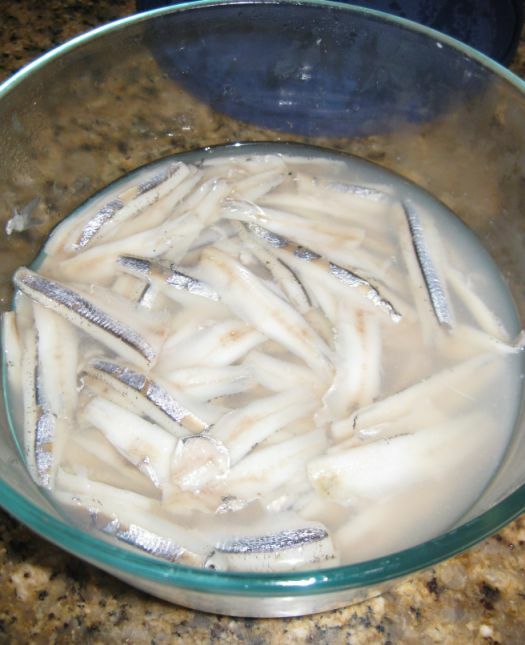 Pour vinegar on top of the anchovies. 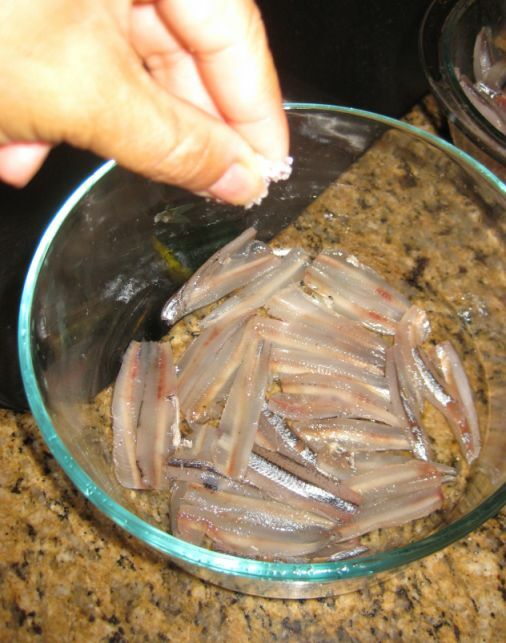 Place another layer of anchovies, sprinkle with salt, and then pour a bit more vinegar. 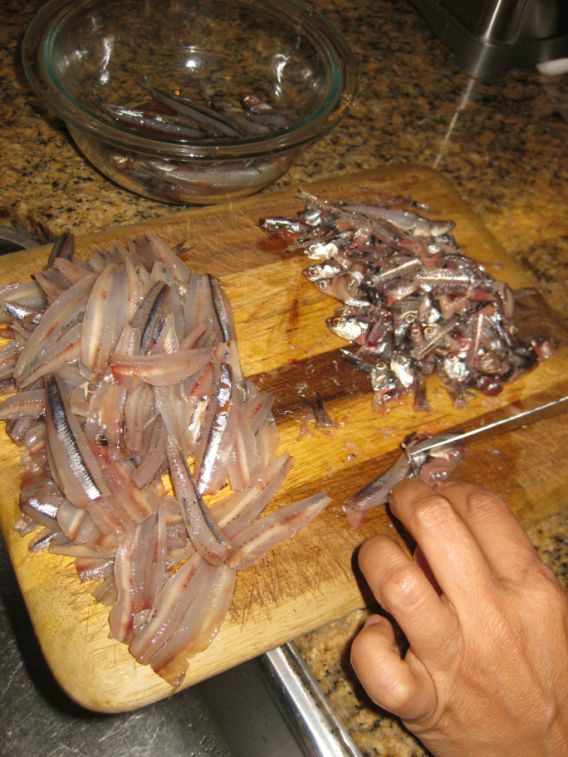 Continue the process until all the anchovies are used. 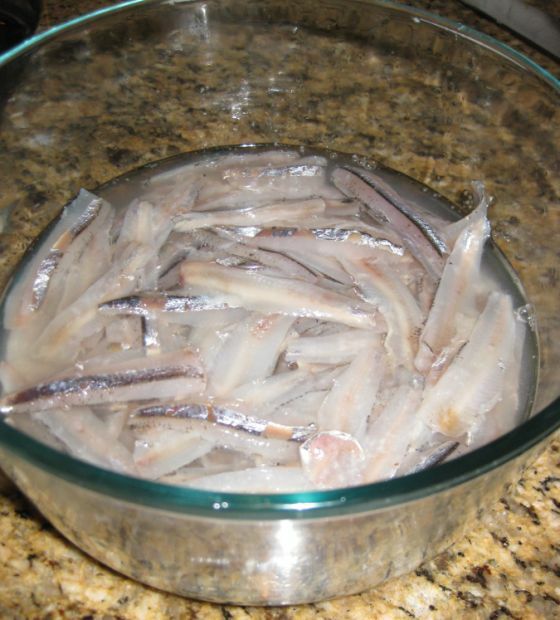 Put the bowl in the refrigerator and leave the anchovies to soak in vinegar for overnight. This is the next day! Notice how the flesh is now opaque! 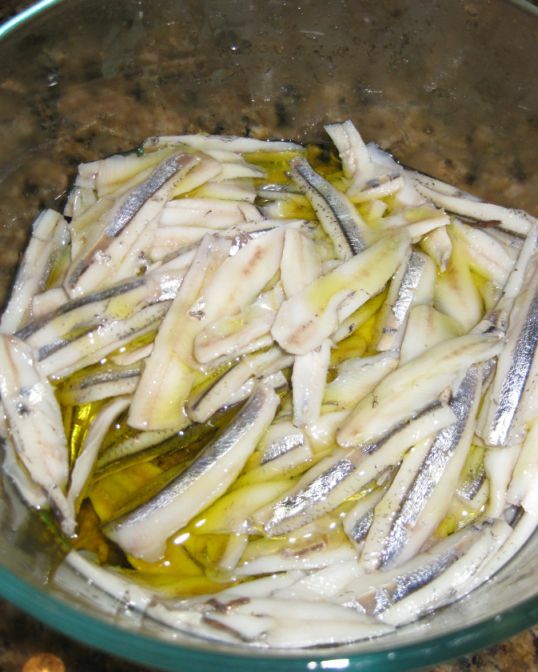 The acidity cooked off the anchovies. Pour away all the vinegar. Rinse gently with water and pour off the water. Cover the fillets with good virgin olive oil. 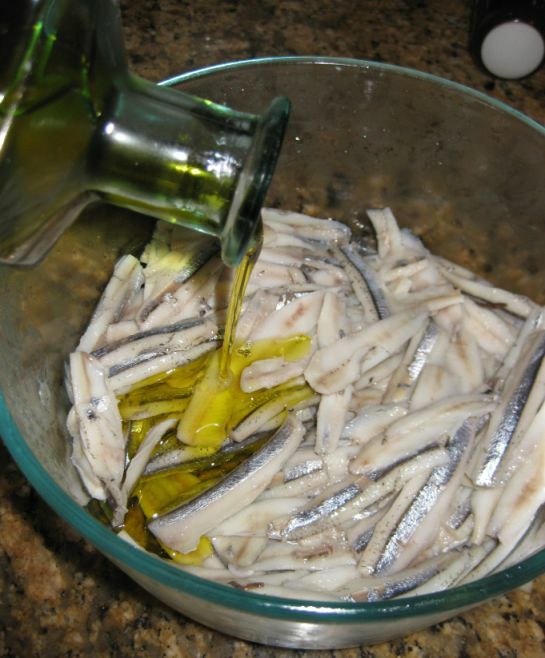 cover the bowl and put it back in the refrigerator for overnight so that anchovies soak the flavor of the olive oil. When ready to serve chopped a bunch of parsley and sprinkle on top of the anchovies.